It is fascinating to see how technologies like the blockchain, AI, Cloud Computing, big data and many more have become the center of discussion on the global panel. Aerospace and defense (A&D) industry are changing rapidly, and the aviation industry is facing new and complex challenges with increasing growth. The blockchain comes as a technology in which the global aerospace and defense experts see potential to solve these challenges. The complex products, deep supply chains with multiple (shifting) participants across the globe creates great inefficiencies, poor quality, and slow-moving parts etc. are few challenges faced by the A&D companies. The features of the blockchain like security, immutability and decentralization are seen as a coherent solution to help reduce maintenance costs, increase aircraft availability, and minimize errors in tracking supply chain. According to the research report from Accenture titled, ”Launchpad to Relevance: Aerospace & Defense Technology Vision 2018,” 86% of A&D companies expect to integrate blockchain into their corporate systems within three years. Aerospace and Defence sector has been a highly paper-based industry. The paper records are created, processed, managed and stored to satisfy regulatory compliance and to ascertain aviation safety and IP protection. The fault is that paper records are time-consuming to create, prone to error, difficult to search for, even harder to extract meaningful information from and lead to constant duplication of documents as they move across organizational boundaries. This is where blockchain steps in – to provide a secure and unchangeable data chain. A blockchain platform would ensure secure tracking and audit of transactions across multiple supply chain and operational partners. The technology is cost-effective as it eliminate4s the intermediaries. Therefore, blockchain can be used to create a single, secure, shared, and perpetual record of the current configuration on the platform. The present scenario hinders the visibility across full supply chain and aftermarket. There has been no ‘part-centric’ perspective that provides a view from the part’s standpoint and gives insight into how that part performs over its lifecycle, whether in the supply chain or while operating. 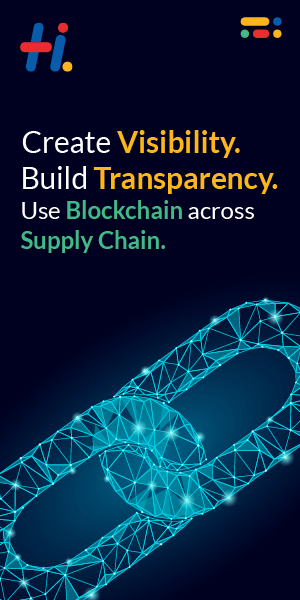 The blockchain can be the foster mechanism to manage supply chain visibility and orchestration across all tiers of the supply chain by improving the tracking mechanism and facilitating coordination between supply chain partners. Safety is a very important factor in the aviation industry. The traceability and visibility from the manufacturing to the installation of parts is extremely important for safety and compliance with airworthiness directives as well as other reasons. Blockchain offers increased accuracy of service history, regulatory compliance, product, and process quality. The blockchain would let us create a digital thread that captures asset configuration from initial design through in-service. This would help to improve engineering-manufacturing integration, asset availability and increase the accuracy of service history. The confirmation of employees, partners, and customers having the rights to use software, services, and warranty of the product at all levels of the supply chain has been a huge issue. Blockchain platforms can assist in improving asset performance and reducing revenue leakage. Many of the supply chain partners in the aviation, as well as other industries, provide less than accurate inventory and lead-time information to avoid running afoul of service level agreements and other contractual performance metrics. The use of blockchain supported multi-supply chain would lead to greater forecasting accuracy and by running MRP and other algorithms on a broader, and more accurate dataset (one in which all parties are incentivized to provide this data) supply chain and economic performance can greatly increase. Now the big question arises – Are we ready for the change? The survey conducted by Accenture showed that 70% of the aerospace and defence executives (who were part of the survey) believe that companies will be grappling with growing waves of corrupted insights as more falsified data infiltrates their data-driven information systems. The blockchain can be a hope for a deteriorating industry as it has capabilities to help Aerospace and Defence companies in every sector from finance, to supply chain to configuration management to the identity of things and numerous other ways. This article has been written according to insights from the research paper published by Delloit and Aerospace and Defense Accenture.